The sacral chakra, also known as Swadhisthana in Sanskrit, marks the second level of our development. It is associated with seeking pleasure, enjoyment, and creativity. It is associated with tongue and genital organs. The emphasis here is on overcoming fear, on pleasurable sensations and sexual interaction. When Sacral Chakra becomes active, it manifests as overwhelming desires. It will result in excessive emotional attachment to people or objects. Sacral chakra is located two fingers’ width above Root Chakra (Muladhara Chakra), in the spine, just above the sexual organs, in the lower abdomen. 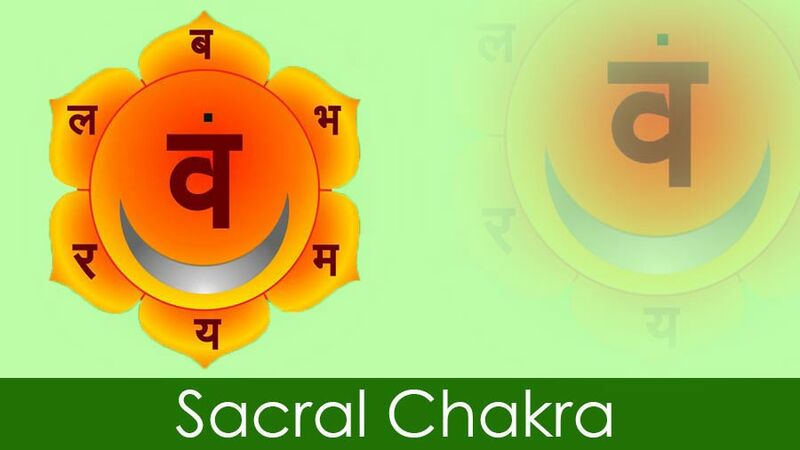 Sacral chakra, whose Sanskrit name is Swadhisthana Chakra, is made from two Sanskrit words “Swa” which means ‘self’ and the word “Sthana” which means ‘dwelling place’. Hence the literal meaning of Sacral Chakra or Swadhisthana Chakra is ‘one’s own abode or dwelling place’. On a deeper level, Sacral Chakra is the seat of the individual consciousness. It is the storehouse of all Samskaras. It is the center of humankind’s deep rooted instincts. Sacral Chakra is symbolized by a lotus with six petals. Orange is the color of the Sacral Chakra which carries meanings associated with emotions, creativity, and sexuality. There is a white crescent moon at the center, which is the ‘yantra’ of the water element. The crescent moon is riding on a crocodile which symbolizes the underlying movement of ‘Karmas’. The Bija Mantra of Sacral Chakra is “Vam”. The Bija Mantra along with crescent moon is riding on a crocodile. A very simple way of healing or balancing the Sacral Chakra is to do more and more of things that bring joy and happiness, like one may like to dance or sing in a manner as if no one is watching. Running and jogging in the morning along with doing Yoga asanas are other things that will help in healing the Sacral Chakra. The mantra that corresponds to the Sacral Chakra is ‘VAM’. Chanting of Mantra ‘VAM’ will help to heal and unlock this chakra. For meditating on Sacral Chakra, just imagine the emergence of a small orange or crimson ball below the navel grows larger and larger with every deep inhalation. Further, imagine this orange/crimson ball of energy start to swirl in the clockwise direction, causing a slight tingle in the lower abdomen where the chakra is located. Continue meditating on this swirling ball. It may result in a tingling at lower abdomen or may result in the buzzing of energy flowing throughout the body. For the meditation on Sacral Chakra, one can also visualize a vast and deep ocean with dark and huge waves under a dark sky. The tides of the ocean represent the ebb and flow of awareness. Since Sacral Chakra (Swadhisthana Chakra) is located at the lower abdomen area so any asanas that activate this area will help. Eka Pada Rajakapotasana (One-Legged King Pigeon Pose) — One-Legged King Pigeon Pose is practiced in a seated position and is one of the hip openers backward bend pose. Practicing One-Legged Pigeon Pose make hips supple and flexible by removing the accumulated stress from them. This asana stimulates the abdominal organs to allow for the healthy flow of energy through the second chakra. For more detail of this asana, read – Eka Pada Rajakapotasana (One-Legged King Pigeon Pose) – Hip-Opening Yoga Pose. Navasana (Boat Pose Yoga) — The stimulation of abdomen in Navasana helps improve and strengthens the core which allows for activation of the second chakra. Further detail of this asana can be had in the post – Naukasana (Boat Pose) – The Best Way To Soften The Abdomen. Sacral chakra healing stones include Orange Carnelian, orange calcite, and other orange stones. Moonstone, Snowflake Obsidian, and Amber can also be used for the purpose. Orange carnelian is used because of its unique healing properties. Amber stones are known for drawing energy into themselves while Snowflake obsidian restores balance to the body.